A few hours worth of birding in Windsor this afternoon resulted in some quality birds and included my first landfill trip of the winter. It's that time already! 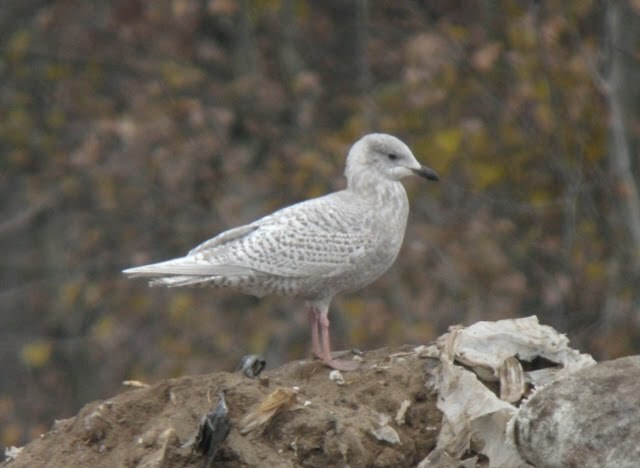 Highlights at the landfill included 2 "KUMLIEN'S" ICELAND GULLS (first cycles) and 2 LESSER BLACK-BACKED GULLS (adult and 4th cycle). A cooperative LAPLAND LONGSPUR fed along the weedy edges. Lesser Black-backed Gull, presumed 4th cycle (maybe 3rd?). Some duskiness on the tail, black on the bill, black in the primary coverts, yellow-pink legs, and small white primary tips all indicate immaturity. At first glance I considered some HEGU genes in this bird based on bulk and it seemed a bit pale in certain light, but on closer inspection I couldn't appreciate anything outside the range of a pure LBBG, including structure. This small-billed, somewhat round-headed, and dark-eyed Herring Gull caught my attention. Appeared to be a full adult bird. Other than the dark eye, nothing outside normal range of American Herring to my eyes. I couldn't turn it into anything other than a dark-eyed HEGU. 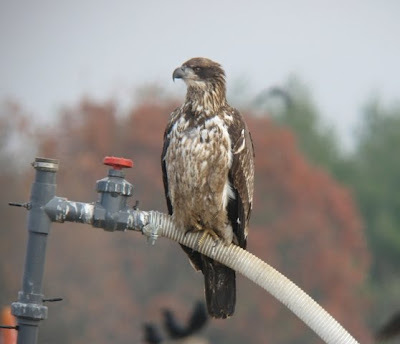 This Bald Eagle made a few appearances near the gull gatherings, but overall wasn't too bothersome. 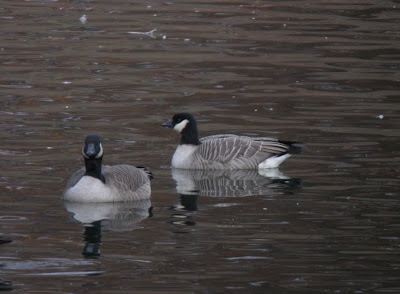 After the landfill I meandered along Day Hill Road & vic, looking for geese & more gulls in fields/ponds. The business park off Rte 187, specifically along Waterside Crossing, has a pond that can hold geese. There was a flock of a few hundred geese here including a continuing BARNACLE GOOSE and "RICHARDSON'S" CACKLING GOOSE, presumably the same birds originally found by Brian Kleinman a couple weeks ago. Also on the pond was a drake WOOD DUCK, and a lingering inland OSPREY flew overhead with a small fish in its talons. A flock of 13 HORNED LARKS also flew past. 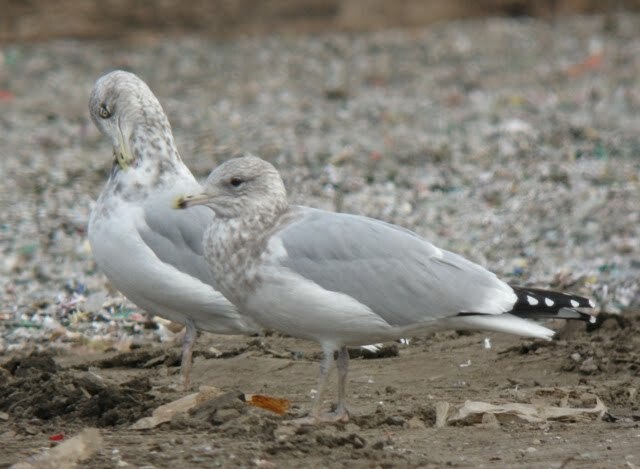 Why is the adult gull with dark eye not a Thayer's? While superficially that dark-eyed adult resembles a Thayer's (dark eye, somewhat delicate rounded head and small bill), upon further study the similarities ended there. Other than the dark eyes, the bird is structurally within the range of HEGU to me. Even the dark eye is possible...every winter I see a couple birds with dusky or dark eyes that are otherwise typical HEGUs. Otherwise, the underside of p10 was clearly jet black with a white window. Orbital ring in the field appeared to be dark orange, which is also darker than typical HEGU but not typical for Thayer's either. Leg color (flesh-pink) and mantle color (same as neighboring HEGU) were fine for Herring. While I'm not 100% sure this is a pure HEGU, that's the closest ID I can come up with. When no alternative can explain it, "weird Herring Gull" seems to work :) I wonder if this could be something like a 4-yr old bird that is lagging behind in a few bare parts such as iris color and bill color.